Built to be installed up against a wall, the Breathing Air Module provides unsurpassed value and peace of mind. Five hinged maintenance inspection doors provide superior access to all components. The unit comes fully equipped with an automatic condensate drain muffler/reservoir. 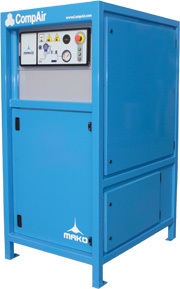 Product value is guaranteed by the ISO 9001 quality standard achieved by the manufacturer of the compressor. The air purification system is installed inside the cabinet. Charging rate based on filling an 80 cubic ft. (free air) cylinder from 0 to 5075 psig (350 Bar), for 5000 psig ratings; and from 0 to 6000 psig (414 Bar) for 6000 psig ratings.